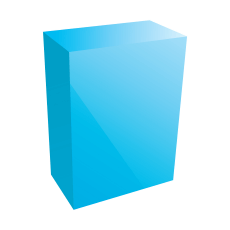 Software Tools Archives | Writing Assistance, Inc. Writing Assistance, Inc.
Adobe recently announced it has released an update for FrameMaker 12 (FM 12.03). Sr. Product Manager for Adobe Technical Communication Products, Kapil Verma provides a summary of the enhancements and bug fixes included in the release. A number of bug fixes have been made as well. Was there one in particular that was bugging you and did it get fixed in this release? You can get more details on the release at Adobe’s TechComm Central blog. No matter what type of writer you are, the fancy technology tools out there are intriguing. They promise to help you write books, to create plots, and to follow your characters. But for the working writer, what technology is worth your time and your money? The best tools of the trade are those that do what you can’t actually do on your own, or organize tasks that you might otherwise have trouble organizing. For example, some writers get so focused on their writing that they can forget to stand up or to head to the store for milk. Today, there are timers and applications that can help you with remembering these sorts of tasks. As a profession, technical communication has a lot to be proud of. Thought leaders in our discipline have developed innovative ways of creating, managing, and delivering information that are in use today at some of the world’s biggest companies, government agencies, and educational institutions. Because of our best practices and lessons learned, it’s not only possible for these organizations to deliver the right information to the right people in the right format and in the right languages (increasingly on myriad mobile computing devices), but it’s also possible for them to do so efficiently and effectively. And yet, many organizations that employ technical communicators have yet to adopt these new methods (XML, Component Content Management, and Dynamic, Personalized Publishing) despite the many case studies and success stories touting the efficiency gains and sales increases possible when thinking strategically about the way we create, manage, and deliver information to those who need it. Even with the promise of return on investment in relatively short order, many of our ilk are still creating content in the most inefficient and ineffective ways possible. 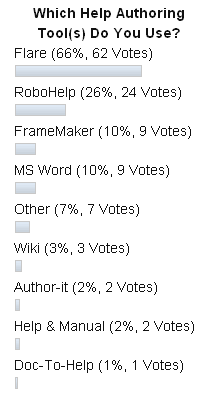 The Help Authoring Tools poll, featured in the left column of our blog, has been running for 3 weeks now. And though there have only been 94 voters so far, I thought it was a good time to look at the results and see if any trends can be spotted. 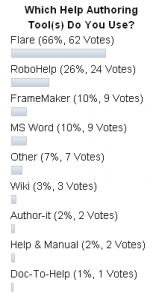 Of the readers who have participated in the poll so far, just about 2/3rds (66%) are using MadCap Flare and another quarter or so (25%) are using RoboHelp, making knowledge of those two tools the apparent standard for help development – at least within the small sample of readers who’ve participated to date. Even with a small sample size, those numbers are impressive, especially for Flare, the relatively new kid on the block. FrameMaker and MS Word are tied with a usage rate of 10% each. That seems like a paltry number for those two tools, don’t you think? My understanding is that Framemaker remains the default tool for Department of Defense (DOD) projects, and traditionally has been more localization friendly. Are Wikis the Future of Technical Communications? Do you think wikis and wiki-enabling tools like Confluence are the wave of the future? Using a wiki for documentation seems like a good idea – at least on the surface. Wikis have the potential to allow users to help each other by filling in gaps in the documentation and providing shortcuts that the technical writer may not have considered. By tracking user updates to a wiki, you can get some valuable information on both the product/procedure and its documentation for future improvements. However, migrating content from a legacy system to a wiki would seem like a daunting project at best. Browsing through WAI’s current list of job openings for technical writers, I noticed three jobs specifically mentioned strong knowledge of MS Word and one mentioned Frame. None of the other postings mention any of the tools that are included in the poll. Yes, technical writers use a variety of tools for various tasks, including Visio and AutoCAD software, and those are mentioned occasionally. I would still love to hear from those of you who already participated in the poll (and those of you who haven’t done so yet). I strongly suspect many of you use multiple tools – that’s why the poll was configured to allow you to vote for more than one. But I’m also interested in the difference between independent contractors, who may have to use a variety of tools throughout the course of a year for different clients/projects, and technical writers who are employed as full-time staff. Finally, we’d like to know the types of projects/deliverables for which you’re using the specific tools that received your vote. Please leave a comment (and get your friends to vote so we get a larger sample size) and let’s get a discussion going! How Important are Specific Software Skills for a Technical Writer? Being a technical writer requires an individual to have a variety of skills, not the least of which is a strong sense of communicating to a target audience. However, many a technical writer has been passed over for employment because the tech writer lacked experience with a specific piece of software – such as Adobe’s Framemaker. Unfortunately, this can extend so far as insisting on experience with a specific version of the software or else that candidate can be vetted out of the hiring process very quickly. While in some cases insisting on experience with a specific software tool may be justified, employers shouldn’t overlook the fact that technical writers are skilled in learning and then passing on what’s been learned to others. If the technical writer doesn’t fully understand the product or software he or she is charged with documenting, presenting information about that product or software in clear terms is impossible. The rights tools are going to help technical writers do what they do best – write. By helping the writer assemble solid documentation, the right software will allow for a speedier turnaround, more streamlined creation process, and standardized results. While there are a number of tools readily available, Madcap Flare is a software program that seems to be suitable for helping businesses large and small begin to work on their technical writing needs. Madcap can also be used with existing technical writing content, helping you to continue work you have started, without having to start over. If you’re having troubles deciding whether or not to use Madcap, there are a number of free tutorials available on their main website – http://www.madcapsoftware.com/products/flare/overview.aspx. 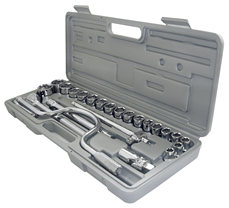 These are good for you to review to learn the basics in order to aid others who are being trained to use the tools. Have you adopted MadCap Flare in your organization? How would you compare it to other tools you’ve used, such as RoboHelp and Framemaker? Please leave a comment. Technical Writers – How Important is Specific Software Experience to Your Project? While the 2010 MadCap Software Roadshow might be winding down for the year, the lessons it’s passed on to those who attended continue to inspire and to educate businesses, HR departments and even those who are looking to begin a career in technical writing. The writing world has changed in recent times. With the innovations in technology, not only are people able to reach out to more audiences, but businesses which were never meant to be global now are – whether they are prepared or not. With the proper technical writers, a business will be able to create a strong presence on the Internet as well as in publications designed to educate, inform, and to boost the reputation of a business. Reusing content as often as possible – Reusing content used to be a no-no in the business world, but now content can be used and reused in order to market and to inform. While content is only written once, it can be used multiple times to reach a wider audience. Creating content for different publishing platforms – When creating a single piece of technical content, making sure it can be viewed and used over email, mobile applications, and the Web is of the utmost importance for maximum effectiveness. Measuring document effectiveness – If you’re sending out documents, you need to make sure they continue to be effective over the long term. Working together as a team – Though one article might only attribute one person as its author, this doesn’t mean that multiple people weren’t involved in creating it. By creating a cooperative team, technical writing becomes easier and more efficient from start to finish. Though other subjects were also explored at MadCap events, just knowing what others are concerned about can help you to begin to investigate issues which will support your technical writing needs, both now and in the future. Adobe’s webinar information page more information on the event as well as system requirements needed to participate in the session. Software maker ComponentOne recently announced the release of its Doc-To-Help 2010 v2. A good portion of the technical communications community is familiar with Doc-To-Help, which is used to produce desktop, Web and print deliverables. The company’s announcement indicated that this release focuses on Microsoft’s current and upcoming releases, Visual Studio 2010 and Office 2010, as well as improvements in usability. ComponentOne said it has had a close relationship with Microsoft for over 20 years and that Doc-To-Help is the first help authoring tool to support Microsoft Word 2010 (which has not yet been released), Microsoft Help Viewer 1.0 (Microsoft’s newest Visual Studio Help format) and Microsoft’s Team Foundation Server 2010. Dan Beall, product manager at ComponentOne said the company wanted to make sure that Doc-To-Help will cause no delay when an organization whose technical communicators are using Doc-To-Help decides to upgrade its Microsoft infrastructure. Beall also said that some of the new and enhanced user experience features in Doc-To-Help 2010 v2 include: Word Count, Topic Placeholders and Automatic Update of Custom Table of Contents. Visit the Doc-To-Help website for more information. Technical Writers: How Important is Specific Software Experience? If you are a technical communicator, what software tools do you use? If you hire technical communicators, how important is experience with a specific software tool when it comes to selecting new hires? Leave a comment!